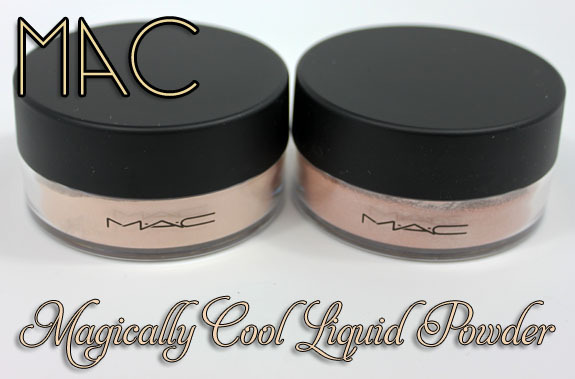 Just in time for summer MAC is offering us three color choices of their Magically Cool Liquid Powder. This powder made it’s debut during the Venomous Villains Dr. Facilier collection with the colors Truth & Light and Cajun, but now we also have the lovely Honey Rose. What these are, are a combination of water and powder that apply like a loose powder does, but they have a very cooling feeling to them. They have light diffusing pigments in them which is supposed to help soften fine lines and create a nice glow. These are now part of the permanent collection. 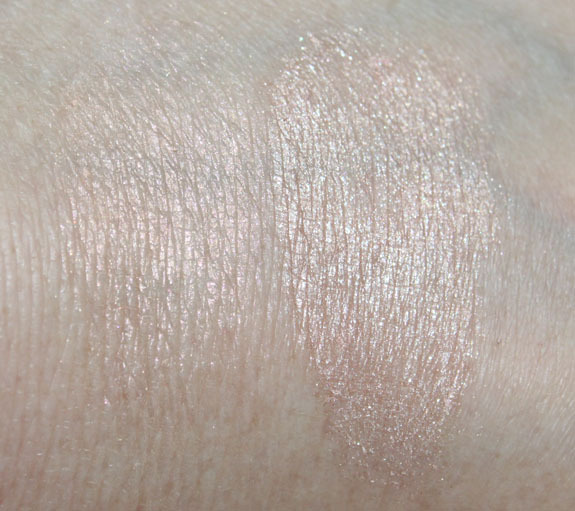 Truth & Light is a verrrrry sheer wash on my skin tone, almost blends right it just showing a little bit of shimmer. That can definitely be nice for a very subtle glowy look. 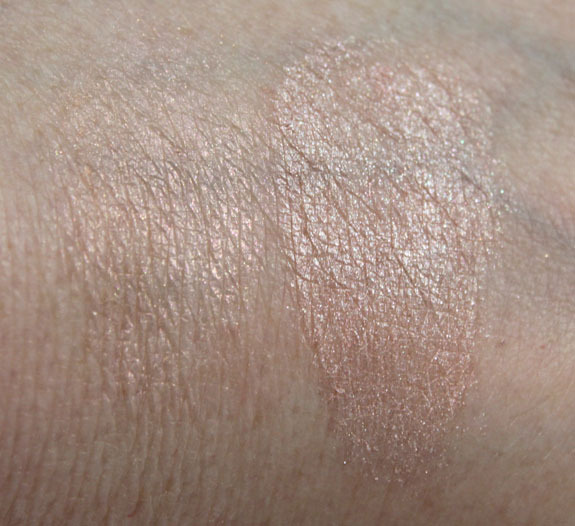 Honey Rose is a really pretty peachy color on me that shows up better and also imparts a really nice sheen. The thing about these powders is they are a little weird. They are definitely extremely soft and fluffy feeling and have a great cooling almost watery feel. But using them is kind of strange. When you rub them into your skin at first, the powder kind of balls up but then it spreads out. 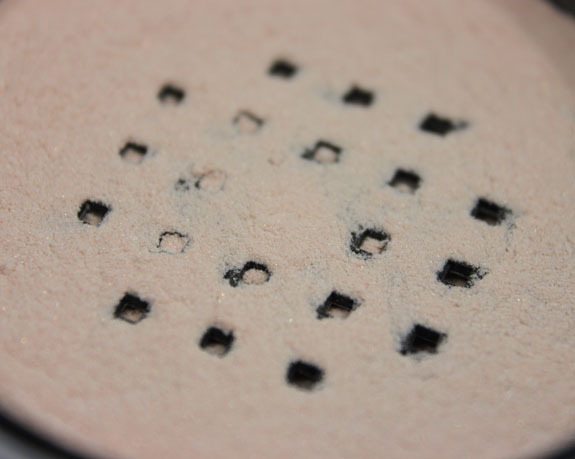 But the little balls don’t always spread into a fine layer of powder so you have to brush them off. Again, strange stuff but also kinda cool. 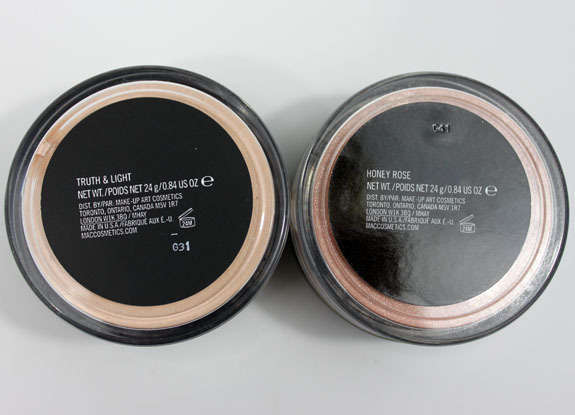 To be honest I never really busted out Truth & Light other than one time, but I really do love the color of Honey Rose, so I think I will be more inclined to wear that one. Did you ever try these with the Venomous Villains collection? What do you think about them? The sheen showing up in your swatches is very pretty. And very interesting to know about the unique formula. I originally had Cajun but had to return it because it was too dark. I really want to like these but I just can’t get them to apply well on me. No matter what I try they ball up and won’t spread out. I tried brushes, fingers, sponges, even cotton balls! What do you use to apply them Kelly? These sound a lot like the Magic powder by Perscriptives. You can still get it online. 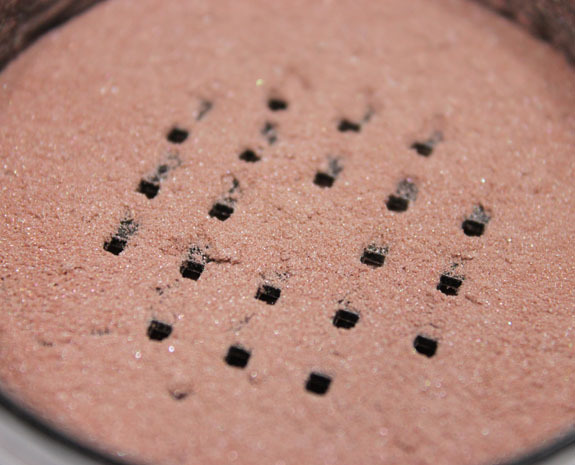 It is more translucent and doesn’t bead up like the MAC powders. It is my number one must have because it ads a very subtle shimmer, brightens your face, gets rid of the red, sets your foundation, and makes it look airbrushed. Strange that they ball up. Don’t think I’ll bother with these. Ooo..I might have to try one of those. Do you know if you have to get the brush with them? I know with some of these water based powders, they recommend getting these special brushes, but I am not inclined to pay that much for a brush! You don’t have to but it is the kind of brush you would want to use with them.